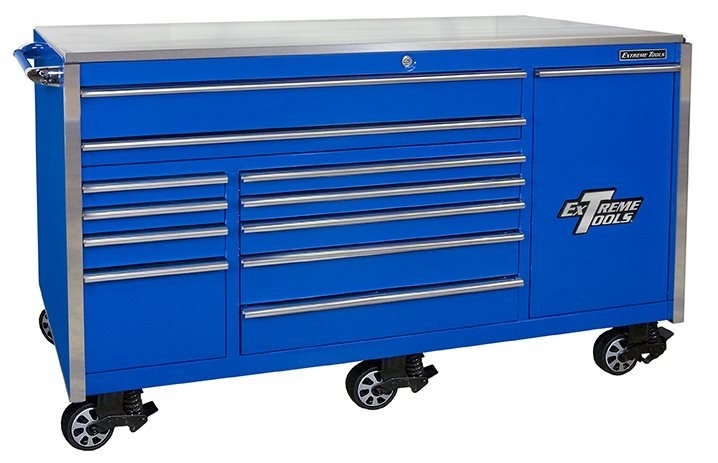 "BIGGER THAN HUGE" - THIS GIANT TOOL BOX IS A FULL 77" WIDE AND THE BIGGEST TOOL CABINET ON THE MARKET! The vertical power tool drawer alone in this roll cabinet holds more tools than your average toolbox, with a roomy storage area of 10.5 cubic feet. The vertical drawer also includes a peg board design for organizing your tools, as well as two adjustable shelves, and a four-outlet power strip. Double steel wall drawer front design creates more rigidity and strength per drawer.